Mumbai: Reliance Retail Ltd, an arm of Reliance Industries Ltd (RIL), India’s biggest company by market value, has embarked on a restructuring exercise that involves shutting, relocating or resizing at least 200 of its smaller stores, said two persons familiar with the development. The firm has also temporarily shelved expansion plans to focus on making existing stores profitable. It currently has 816 stores in 60 cities. “The company will relocate some unprofitable stores and even close down a few, and some of the smaller stores will be integrated into the larger hypermarket format," the same person said. A supermarket typically ranges between 1,000 sq. ft and 5,000 sq. ft in size, while a hypermarket can be between 100,000 sq. ft and 200,000 sq. ft. As part of the restructuring, Reliance Retail plans to reduce the size of some stores. 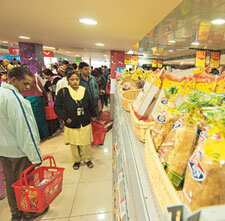 It recently cut the size of its Ahmedabad hypermarket to 100,000 sq. ft from 165,000 sq. ft. In the smaller supermarket format, too, some stores have been reduced in size, the person added. Neucom Consulting, the company’s external public relations firm, declined comment on the development. The second person familiar with the development, a company executive who did not want to be named, said such resizing and restructuring is happening across cities, and expansion plans are either being put on hold or significantly reduced. For instance, an initial plan to have 70 small stores in Pune, which already has 20, has been pared to about 30. The company is cancelling realty agreements now considered expensive and not in sync with current times. Even in Mumbai, the initial target of opening 100 stores has been scaled down to around 70. Mumbai currently has about 40 outlets. “The company will shut down stores that are not viable, bring down the present size of the stores and also cancel some of the agreements that were signed when rentals were high," the executive said. The restructuring comes at a time when the entire organized retail industry is scaling back expansion plans. “If Reliance Retail is restructuring, it is nothing out of the ordinary. Recently, even Future Group and Spencers have made changes in their strategies as they understood the business better with time," said Arvind Singhal, chairman of management consultancy firm KSA Technopak Advisors. “Reliance Retail started just 18 months back and they are likely to experiment with the formats for quite some time, and certain amount of changes will keep happening" Singhal said. “Closing stores and relocating in viable locations is done by most of the retailers across the world and Reliance will also consider it." In a 30 October research report, investment research firm Clear Capital Ltd, an associate of UK-based Noble group, said falling margins were affecting the profits of retailers. “The minimal cash generation and wafer thin operating margins in the range of 4-14% (average of ~7%), in what is considered to be a highly cash-rich business the world over, a lack of cash generation, alongside the high leverage levels (average debt to equity of 1.1x), have left the retailers looking exposed," its analyst Jaibir Sethi wrote. At RIL’s annual general meeting in June, Mukesh Ambani, chairman and managing director of the company, spoke about the retail business being on track to “create a significant value-creating platform." The retail business of the company continues to open new stores in the smaller formats and the recently unveiled Reliance Footprint, which sells footwear. According to the company executive, Reliance Retail is looking to consolidate its back-office operations as well. About six months ago, it closed down a collection and processing centre in Pune. In a related development, the company is reopening some stores in Uttar Pradesh that were earlier selling vegetables and grocery items. These stores, which were asked to be closed by the state government following protests, will now retail non-food items. For instance, its outlet in Noida’s Shopprix Mall that opened on Thursday is now selling home furnishings.